Good: Great graphics and superb gameplay! Have you ever thought of stealing something? Living on the edge? But what if you were caught? Well, be ready to experience these things from close by. Things will get edgy in Sneaky Sneaky and you will have to venture loads of areas to find new loot. The story in Sneaky Sneaky is really simple. You are a thief that likes everything that’s shiny and that’s worth a lot. Together with your friend Squeaky you’re the terror of the rich. When you’re running away with quite some shiny gems from the Sultan’s vault, you run into an ambush and you’re captured. This is when the fun starts. If you want to live it is a great idea to escape from your cell on a sneaky way. Although this seems like a short game, it will be the beginning of a new adventure since you want to get your shiny gems back! Graphic wise this game is really nicely done. The game is a 2D overhead game and has a particular drawn and comical-like style which really suits the game. 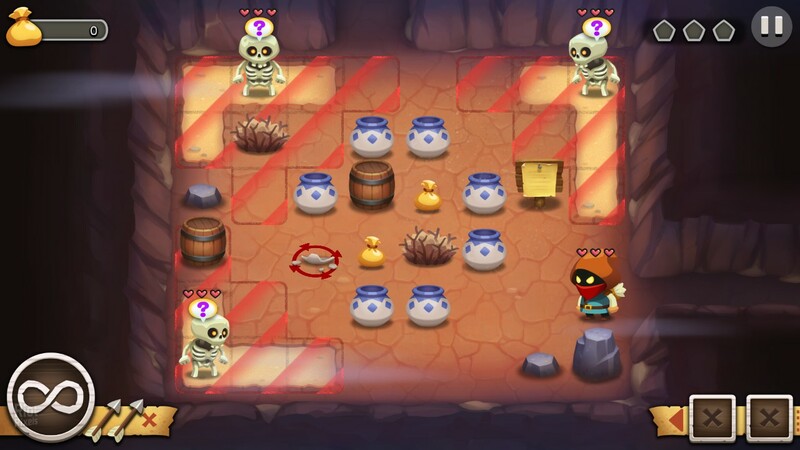 Sneaky Sneaky has some vivid colours, making it really fun to play. The areas have a lot of the same elements but this isn’t such a bad thing as the environment is well done and it isn’t that troubling. The game has some nice soundtracks and a few effects. The music is really subtle but fit each area very well. A walk in the forest gets a vibrant but serene track, while the cell area receives a bit more dangerous sounding music. There are sound effects present and give a nice dimension to the game. Shooting arrows have a nice swoosh, while entering a bush has a lifelike sensation due to the effect. You might wonder how the game really works. 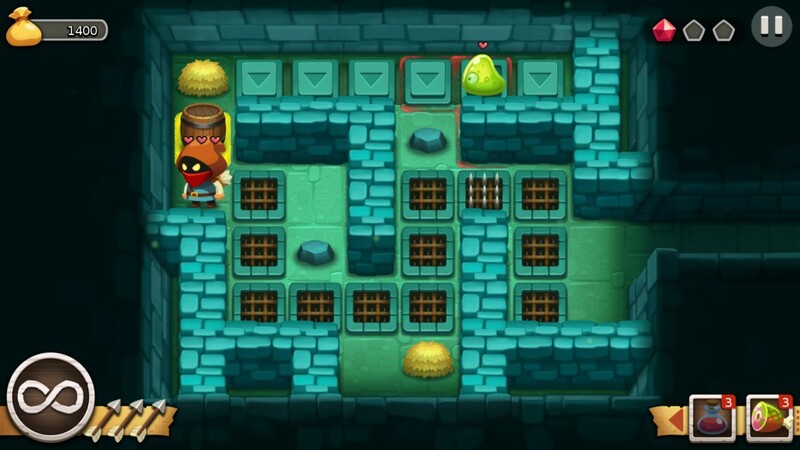 Sneaky wants to get his riches back and he only has three hearts, so be considerate about them when you venture those evil lairs. 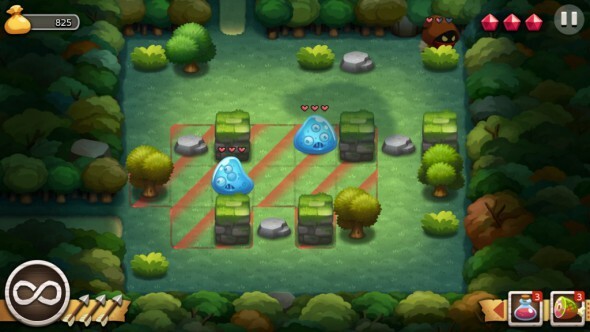 When entering a level, you receive a 2D overhead map in which you will have to navigate Sneaky to the exit. When you get to the end, you can enter the next level of this area. Each area has its own setting, but the puzzles seem to be a lot alike. The enemies you encounter are different and it would be nice if you would get a bit of extra info about them, although this is what gives the game that extra bit. Getting to the end of a level means that you will have to get through multiple rooms and overcome several obstacles. You can choose how you deal with these hindrances, but the best way is to do it sneaky … like a boss. This might be hard for a normal person, but not for Sneaky. He can hide in bushes or haystacks, giving him a nice advantage because he has the chance for an ambush. There are several items to execute your enemy. You will have your trusty knife and bow. You can gather arrows from trees or barrels, so you don’t need to worry about buying them. You use your knife by clicking on an enemy, while you will have to pull back your mouse while clicking to ready your bow. It will be a bit hard to aim at the start, but you’ll learn the tricks soon enough. The game has some other items to offer as well, for example ‘the meat’. Enemies want to get a nice bit of meat once in a while. When you place it on the ground, the enemy will come running for it and you get a nice advantage, since you can ambush him now. Sneaky Sneaky assured! There might be times that your enemy will spot you. This means that the enemy gets three turns to get to you and kill you. When his turns are over, this is your chance to turn the tables and kill your combatant in three turns. When your three hearts are down, you will have to redo that room. No worries though, there isn’t any repercussion. When you killed your enemy, you can walk around freely again. Once you get to the exit, you get bonus point for how many sneaky kills you got and so on. This will give you an overall medal and some experience points. When you level up, you can choose a new perk for Sneaky, so it is important that you get a lot of bonuses! You can buy items in a shop that your friend Squeaky has set up and those items could be really handy to get the job done. You get coins when you kill someone, when you destroy items by finding bags or by killing enemies. It might be a good idea to gain as much money as you can, since it is always useful to have certain perks. Sneaky Sneaky is a really nice and fun game that will take your brain on a trip to “let’s see how we can kill these bastards”. Don’t be afraid to let in on the dark side and go for the sneaky kills. The graphics have their own particular style and the music is just superb. The gameplay has a few flaws here and there, but the joy and fun won’t be any less.